Today is a happy for many as I know that many of you have been waiting for the release of the next part of our Demelza blanket. Wait no more, as today we start with part 3 in which we are making the second flat flower square in the blanket. In the original pattern designed by Cathering Bligh it is referred to as “Flat Flower #2”. The Demelza blanket is designed by Catherine Bligh and is accompanied by a photo tutorial in English and Dutch. There is also an update available with UK terms. The design is inspired by the character Demelza from Poldark, a series of novels written by Winston Graham in the 20th century and adapted for television by the BBC. You can find the video link for the this week’s square, along with all other parts of the Demelza video series on my dedicated page here on my blog or on my YouTube channel. I am using 13 lovely colors of Scheepjes Stone Washed yarn with a 3.5mm hook to make my Demelza blanket. 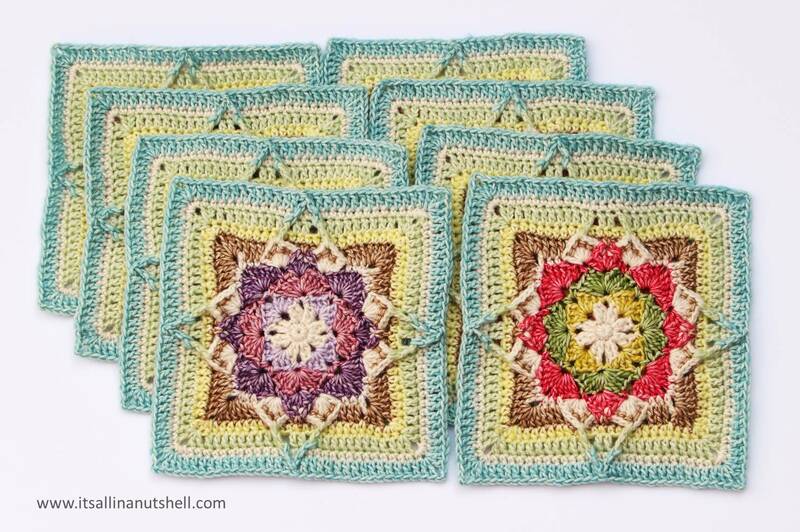 Similar to last time I have made 4 squares each in 2 different colorways to come to the required 8 squares total. Here my colorway for this week. I had some indecisive moments regarding the center two rounds of this weeks squares. I couldn’t decide if I wanted to use a Moon Stone or Citrine center for colorway A and likewise for colorway B. Hence they are a bit mixed with some colorway A squares starting with Moon Stone and some starting with Citrine and vice versa for colorway B. If you are following my colorway, just go with the flow and use the Moon Stone and Citrine centers as you like. My flowery blanket is really starting to look nice. My squares go well together and I really like how it’s all coming together. At this point I have used varying amounts of the all my colors. Rounding up, I have used the following balls of yarn so far: 2 x Moonstone (801), 2 x Boulder Opal (804), 1 x Canada Jade (806), 1 x Red Jasper (807), 1 x Corundum Ruby (808), 1 x Deep Amethyst (811), 1 x Lemon Quartz (812), 2 x Amazonite (813), 1 x Green Agate (815), 1 x Coral (816), 1 x Citrine (817), 1 x Lilac Quartz (818), and 1 x New Jade (819). You can buy Scheepjes Stone Washed from Wool Warehouse (UK/Int), Deramores (UK), Paradise Fibers (US/CA), Caro’s Atelier (NL), or your local Scheepjes Stockist. The Demelza blanket is already completed and if you want to you can start right away. However, I am partaking in this project as part of a crochet along hosted by the Facebook group Pippin Crochet Club. If you want to partake in this CAL, join the Pippin Crochet Club. This is also THE place to show your work. And if that is not enough reason for you to join the group, the admins are running a giveaway each week of the CAL. Maybe you are the next lucky winner of a great prize! I hope to see you in two weeks when we continue with our lovely blanket. Which part of the blanket will be next….? Your colors are gorgeous Esther. Thank you for this labor of love. I am so happy when working along with your videos. Hi Esther. Are you aware that in one of your blocks, you have not done the fptc on one side? Easy to forget I know!!! this is my first CAL and loving it. Yes, i noticed this after photographing them. I wondered if anyone would notice 😀 Makes my blanket personal.